If the website you are subscribed to has enabled the unsubscribe widget then you will see the option at the bottom right corner of your webpage. This widget also allows the management of the notifications you receive from websites. Unsubscribe widget can either be a bell or a button. If this option is not configured you can still unsusbcribe from your browser settings. 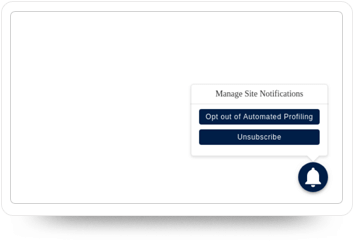 In unsubscribe widget an extra state is added that provides you with an option of opting out from automated profiling. The automated notifications are sent based on your behaviour and actions on the website like cart abandonment. 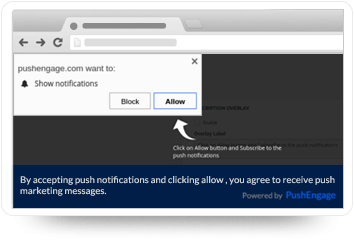 All web push notifications are an individual's preference. They are always asked for an explicit consent and they have an option of unsusbcribing from their browser settings. 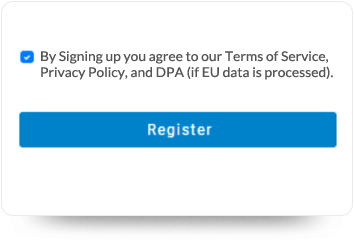 During subscription we are providing a privacy consent notice bar. You can add legal language to take explicit consent from user. This notice bar is also configurable according to the theme of your website. 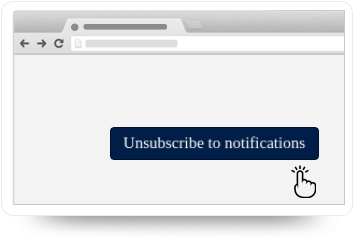 By providing the unsubscribe option, an existing subscriber is allowed to unsubscribe from your push notifications. You can even customize the button or bell according to your brand. This widget then can appear on all your site, or only on one page, which is configurable through your dashboard. 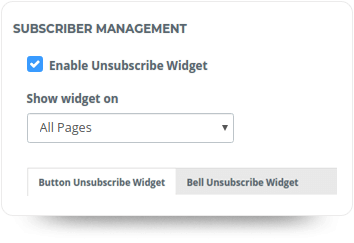 In unsubscribe widget an extra state is added that will provide your subscribers an option of opting out of automated profiling. 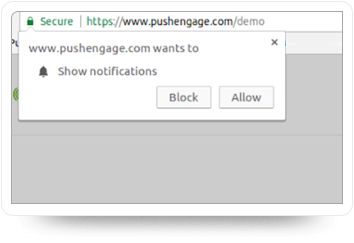 These notifications are sent through automatic responders, triggers, cart and browse abandonment. 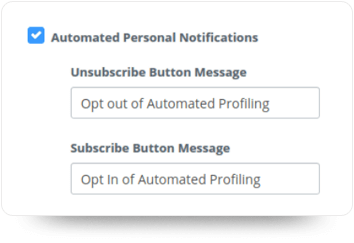 If you are using any automation feature, you can enable this option in your dashboard for your subscribers. 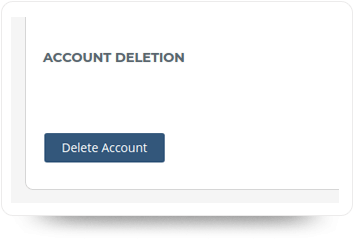 Website owners using our service are provided the option of deletion of account with data retention policy of three days, after which the data will be deleted. We do not store any data longer than three days after the request of deletion. We recommend as a best practice to all the https websites to use your own FCM server key and sender ID. This will help in portability and you will not loose subscribers during migration. 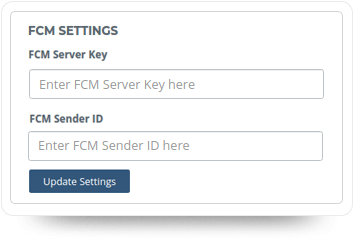 Configuring FCM server key is quick and easy. If you want to enable web push on safari then configuration of safari certificate gives you complete portablity. 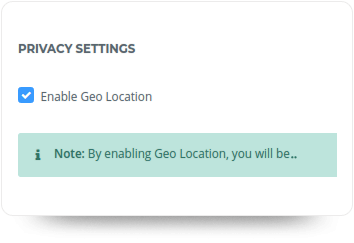 By enabling the Geo Location, you will be gathering City, State, and Country of a subscriber, at the time of subscription. Your subscribers can be easily segmented using geo location. 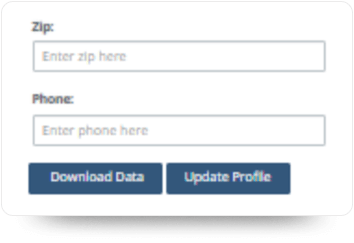 Country, state and city are not classified as personal data but this option is provided to you if you do not want to collect extra data from your subscribers. A website owner will always be provided with option to download their personal data. They can even rectify their personal details using PushEngage dashboard. Every website owner who signs up for using our product gives consent on certain levels for communication. Website owners can edit their preferences any time from the dashboard. How To Enable Easy Unsubscription For Your Web Push Subscribers? Want custom features and enterprise support? Feel free get in touch with us. Copyright © 2015 onwards PushEngage.